To be perfectly honest, this is a book written for a very specific group of people. I happen to be one of those people, or this would have been a three- or four-star review, most likely. However, if you’re following this blog, chances are you’re one of those people, too, so this book might be worth your while. 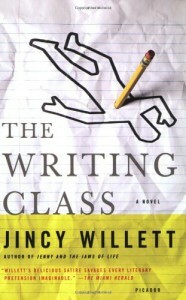 The Writing Class is a book written for anyone who has ever been in, you guessed it, a writing class. Speaking as someone who’s been in about a hundred, I can’t even tell you how on point Willett’s story is. But it’s also just a ripping good read. The Writing Class is a murder mystery for writers and book nerds (so hi, obviously this is the perfect book for me). It follows Amy Gallup, a has-been novelist who’s spent the last ten years or so writing blurbs and an unsatisfactory blog and teaching adult writing courses in order to pay the bills. But her newest group is a surprisingly interesting bunch. They’re smart and eclectic and (in some cases) talented, but most interestingly, there’s a psychopath among them. It starts with a blistering mockery of another student’s work, a devastating anonymous critique, and then escalates to cruel practical jokes and eventually – murder. At the center of the mayhem sits Gallup, struggling to piece together the identity of ‘The Sniper,’ with only textual clues to follow. Eventually the whole class gets on board, despite the fact that they’ve been officially disbanded. Using Gallup’s critical process, they collectively examine the Sniper’s work, hoping to identify the culprit. It’s difficult work, because nobody can be trusted, and personal feelings get in the way of objective investigation. It’s a smart, fast-paced story, to be sure. But that’s not why I enjoyed it so much. Willett’s portrait of the typical writing class is what sold me. It’s so absolutely on point that I laughed out loud on more than one occasion and found myself saying, “Oh my God, I know that person.” Even funnier (and slightly more surprising) was when I looked at once of Gallup’s pupils and said, “Oh my God, that’s me.” (I’m Chuck, if anyone who’s read the book is wondering.) Willett has the perfect cast of budding writers – from the overly PC feminist warrior always looking for a fight to that one guy who’s only ever brilliant by accident. In Gallup’s writing class you will find everyone you’ve ever been in a writing class with. Not to mention, the atmosphere is so perfectly constructed that I found myself actually picturing the last classroom I had a writing class in – identical down to the detail of the box fan that’s always just a little too loud. If you’ve ever been in a writing class, you need to read this book. If you’ve ever considered taking a writing class, you need to read this book. If you like books, you need to read this book. If you’ve never done any of those things why are you here you should read it anyway. You might ask yourself why you want to surprise your readers in the first place. A surprise ending is sort of like a surprise party. Probably some people, somewhere, enjoy having friends and trusted colleagues lunge at them in the sudden blinding light of their own living room, but I don’t think most of us do.